🙂 Seems like I’m in a Downtown Disney kind of mood so far this week. There’s a big Lego store at Downtown Disney, and they have decorated the outside with life-size-and-beyond Lego creations, including this dragon in Village Lake. This is only part of him – he’s a rather long serpent, and to get all of him in the shot, from this angle anyway, would require standing so far away, you would not be able to see his tongue hanging out or his googly eyes. Despite his sharp-looking Lego fangs, I think he looks sort of doofy and humorous, don’t you? Not scary at all, at all!. My favorite Lego creation down there was a life-size tourist with a bald head, sitting on the bench taking a nap. Every now and then, it would start snoring 😉 I’m not sure he is still there, but next time I’m in The World, I’ll check it out and report back! You put a smile on my face! 😉 Cool shot! Amusing shot. No, I don’t think he looks too scary, but it is entertaining just the same. Hah! that is pretty cool. I haven’t seen life size Lego creations, but I bet they’re pretty neat. That’s pretty cool. I like that they have it coming out of the water. That’s something I would like to see that person. Hi Tink! This one I have actually seen, LOL! He’s very cool. I haven’t seen the Lego tourist, though – hope he’s still there. I’m going nuts trying to remember the name of the resort in the background – it is The Villas, or something similar? Am glad you aren’t wordless today or I wouldn’t have understood what it’s made of. But quite some impressive work here. They are just so creative, this makes for a creative post too. I love this guy – what a treat! My kids loved legos growing up and now my grandbaby is playing with the big legos. Hi Tink, your posts are always fun, full of energy and laughter too! i better follow you everywhere you go! I love this dragon! He’s one of our favorite things in ALL of WDW! ” What are you doing with MY boyfriend?” LOL!! Sisters with the same taste in men!! LOL! Legos were among my favorite toys as a kid, so they always have a nostalgic quality. And yes, I did visit the Lego store in Downtown Disney – I sometimes attend an annual music-industry trade show in Anaheim. Wow! Now that is impressive! That’s a Lego sculpture? Gee, I wonder how many pieces it took to create that?! That’s a great photo. How fun! I cannot imagine building something like that with Legos. We have hundreds of Legos and I hate them all. So not my kind of thing, but your dragon looks awesome. I always thought my childhood Lego creations were fabulous, but looking back…LOL! Now this dragon is truly astounding. such a cute green snake. lovely photo. I look at that and wonder – How long did it take them to build that thing. Those Lego statues are always so neat. You really have me jonesing for some time at Disney World. Great photo! 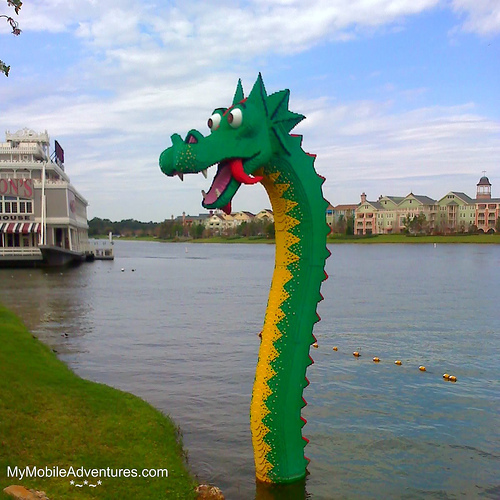 Hi Tink, yeah he looks goofy but to think that there’s can be a real dragon in that water gives me goosebumps. Thanks for sharing another Disney view. He is HUGE!! But he looks friendly to me!! My feet were a dragging….after seeing your post…I’m skipping. Tra la la. This lego always reminded me of the song “Puff the Magic Dragon”.